That’s how 16 year old Lucy, a visitor to the Finger Lakes from Pittsburgh, PA, described her experience soaring in a hot air balloon in July. The ride was a birthday gift for Lucy and her 15 year old cousin, Amy, who hails from Golden’s Bridge, NY (just outside of New York City). According to Amy, the ride was “unforgettable”. 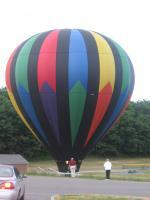 For those with an adventurous flair, a hot air balloon ride around the Finger Lakes region is a peaceful, yet exhilarating, way to experience the breathtaking beauty of the area. Capt. Carroll Teitsworth, owner and chief pilot of the Liberty Balloon Co. (www.libertyballoon.com) out of Groveland, New York, offers hot air balloon rides that float just above the trees so riders can enjoy the wildlife and scenery close up and then he takes them thousands of feet into the air in order to offer panoramic views. While some might argue that a similar view is available from an airplane, the advantage with a balloon ride is you have a 360 degree line of sight that is unobstructed, and at a lazy pace, there’s more time to take it all in. On Amy and Lucy’s ride, Captain Teitsworth dipped the basket down so close to Canandaigua Lake that the young women had the thrill of carrying on a conversation with boaters. Try doing that in an airplane! Hot air balloons are a regular sight in the Finger Lakes region, and when the weather is favorable, they are spotted daily. 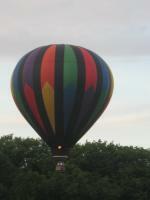 It’s also very common for those who see the balloons gliding above the horizon to follow them to the landing spot. Lucy and Amy’s ride came to a gentle conclusion at Marcus Whitman School in Gorham where dozens of spectators had already gathered to watch the balloon’s descent. The girls were giddy with excitement when they climbed from the basket to reunite with their aunt and uncle, Lisa and Tim Morris from Pittsford, NY, their benefactors for the ride. The fun didn’t end there. Not only did the pilot and his crew invite the girls to help repack the balloon in a huge canvas bag, but the culminating activity was the “Survival Celebration” at the Canandaigua Airport, the point of origin. If you’re so inclined, take a tour of the picturesque Finger Lakes in this unique mode of transportation. You can sing the song Up, Up and Away to your heart’s content as you move along with the breeze. You’re guaranteed a stunning bird’s eye view of some of the prettiest landscape in the country. Like Lucy and Amy, this could be your unforgettable experience of a lifetime. Don’t forget your camera!